SOL 2016 Day 25: Yea for Spring Break! The first day of spring break, and here I am in Portland, OR visiting the family. This weekend I'll celebrate early birthdays with my parents who are both turning 89 next week. I've already gone to an open house with my brother and sister-in-law who are in the process of selling and buying houses. Today the weather was beautiful, which I didn't expect. After all it's March in Oregon. They've been having tons of rain lately, but today the sun was out all day just for me. As has become our tradition, we're staying in a vacation rental. Two years ago I rented an apartment in Washington D.C. for spring break. Last year at this time I stayed in a rental house in Sea Ranch on the northern coast of California. These stays have also helped me start another tradition: buying flowers for each of my stays to help make it feel like home even for a short stay. 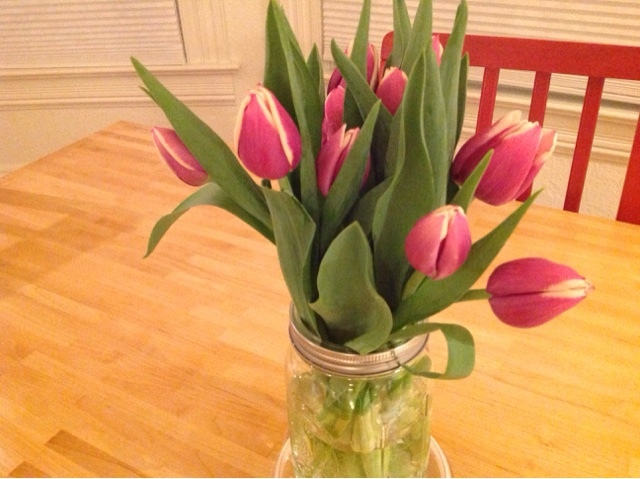 Since it's spring, tulips have become the flowers I look for. What could be more cheerful and welcoming than them?